ANS Issue “Peace & Health” just released! scholarship and research contributes to understanding relationships between peace and health, and evidence that can be used to build family-wide, community-wide, nation-wide and even world-wide possibilities for peace. 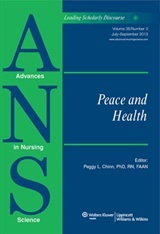 I hope that as a reader you will be inspired to join these authors, and many others in the nursing community to build a science, and a practice, that promotes peace!